Prime Minister Justin Trudeau says dairy farmers will be compensated for their expected losses under the new United States-Mexico-Canada Agreement, making the pledge directly at a meeting with their representatives on Thursday. Trudeau met privately with dairy representatives in downtown Montreal amid concerns in the industry that they're bearing the brunt under the recently concluded free-trade pact. Canadian dairy farmers stand to lose 3.59 per cent of their market to U.S. producers under the new trade deal, known as USMCA. 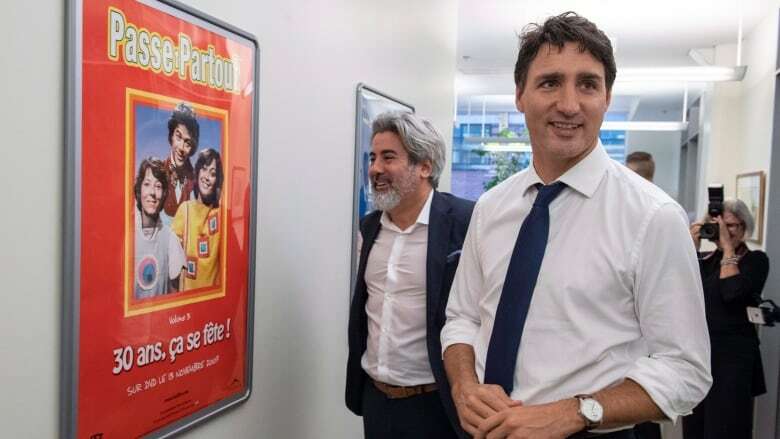 "That's why we're going to be working with them over the coming weeks and months to figure out exactly what is the compensation they need," Trudeau said after touring the offices of Montreal company Seville Films. "How we can ensure not just that they're OK, but that they continue to have confidence in the future of the dairy sector in Canada." While touting USMCA as a good deal for Canadians by securing access to its largest trading partner and the largest market in the world, Trudeau acknowledged those sacrifices. "They told me they were worried," Trudeau said of his meeting with milk producers. "They told me they felt they have continued to give through a number of trade deals they've signed, and they're right." For example, under the Comprehensive and Progressive Agreement for Trans-Pacific Partnership — with 10 countries including Mexico, Japan and Australia — dairy farmers ceded 3.25 per cent of the market. Dairy Farmers of Canada president Pierre Lampron wasn't satisfied with what he heard. "We recognize the symbolism of the gesture of Prime Minister Trudeau in offering to meet with our industry to hear our concerns firsthand," he said in a statement. "However, the absence of details on measures to mitigate the impact of the concessions made within the USMCA, as well as the absence of a vision for the future of our industry at this time, cannot appease the concerns of the dairy farmers." Raymond Bachand, Quebec's chief free-trade negotiator during the recently concluded negotiations, said the number one objective for Quebec was to preserve access to the American market and that was done. "However, Ottawa has sold a portion of the milk market and it is clear that it hurts when added to European (Comprehensive Economic and Trade Agreement) and the TPP deals," Bachand said on the sidelines of a metallurgical conference. "This is eight to 10 per cent of the market. Producers are right to be dissatisfied. But it's not just compensation, but also strategic thinking to see how we make our businesses more competitive." "If I tell you that you are going to lose some of your business, you do not want to wait five years to find out what you are going to have as compensation to be able to manage your finances and knowing where you are investing," Bachand said.